I know that hockey is not an “important” sport in Charlotte, but if you look at the attendance record of the Checkers parent team up in Raleigh you’ll see that a franchise can be highly successful in the south and get some great attendance numbers. In my humble, albeit biased, opinion the Checkers have done an amazing job this year of advertising themselves with some fun promotional nights and putting together the most successful team in the region. Once you factor in the low price and family atmosphere of the games it’s near impossible to compete with the “bang for your buck” factor that the Checkers deliver. 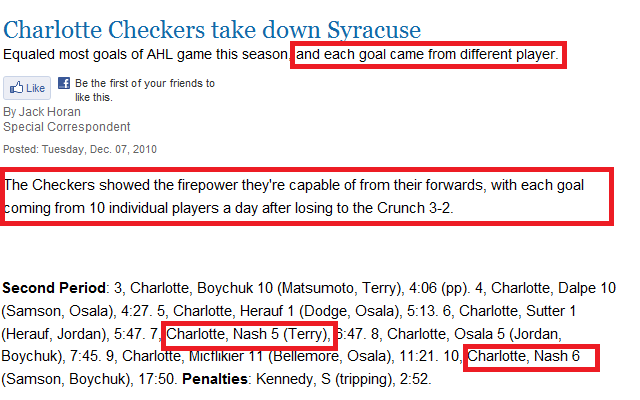 I’m not suggesting that the Checkers coverage be placed higher than the 1-11 Panthers, or the disappointing Bobcats. These are the primary sports of the region. I get that. I truly do. Even the coverage of non professional sports like ACC Basketball, SEC football, and local high school sports is important. But when some of the more visible links and coverage in the sports section focus on articles that are days old why not try to shuffle the focus to something new and fresh? It’s been reported time and time again that print media is dying. By looking at the observer I can understand why. Or maybe what I’m looking at is a result of the slow death. Either way, when checking out the sports section of the site it’s apparent that old media doesn’t get or understand new media at all. But I’ll focus on that in a future post. For the purpose of this post I’ll continue to rant about the inadequate Checkers coverage. 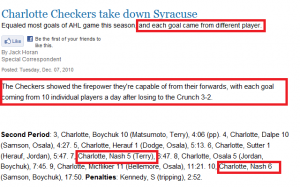 Once you manage to find the article on last nights game, which is about halfway down the page, you’ll see a generic title which tells you nothing about the drubbing that the Checkers put on last night. The article reads like nothing more than a stat sheet put in plain English with two quotes. Even worse, once you get into the article you’ll find that there is at least one glaring inaccuracy. The subtitle reads “Equaled most goals of AHL game this season, and each goal came from different player.” (I put the bold on the important part.) Yet below in the box score they clearly show Riley Nash getting 2 goals. Screen shot below. That’s what the fans at last nights checkers game were saying as they walked out of the arena celebrating the 10-3 route of division foe Syracuse. As the 6th puck of the night crossed the line behind the Syracuse goalie, with 6:47 gone in the second, the 3,517 checkers fans in attendance knew they would receive 6 free wings thanks to a promotion by the Checkers and Buffalo Wild Wings. But the celebration didn’t stop as the Checkers went on to score 4 more goals on their way to a dominating performance. The checkers dominating performance looked great on ice but maybe even better on paper. Nine different players managed to put the puck behind one of the two lost goaltenders that switched in and out throughout the night. Riley Nash was the only greedy Checker to score more than 1. Herauf picked up a Gordie Howe hat trick. (A Goal, an assist, and a fight in the same game) The power play went an impressive 2-for-3, while the penalty killing unit shut down the Crunch on their two opportunities. After all was said and done, 15 of the 18 players dressed in red and white managed to either get a goal or an assist. After a relatively quiet first period that ended in a 1-1 tie, thanks to a late goal by Crunch forward Palmieri, the Checkers exploded for 8 goals in the second period, including 6 goals in a 3:36 time span. The 8 goals in a period marked the most goals in a single period by any team since Providence Bruins scored 10 goals in the first period on Nov. 25, 1998. Strangely enough that was also against Syracuse. Even though the Checkers took to the ice in the third period up 9-1 they didn’t stop their relentless attack firing 14 more shots at the shaky looking Syracuse goalie. They ended up poking one more past the net minder, but only after Syracuse put up two in behind Checker goaltender Murphy, who got his 7th win of the season. The 10-3 drubbing of Syracuse makes Charlotte 8-2 in their last 10 games and puts them in third place, three points behind the Norfolk Admirals in the division. Really? Was that so hard? I know that times are tough for print media but tell me you couldn’t find an intern from UNCC or one of the local colleges to put up a more interesting article than Jack Horan did. No offense Mr. Horan, my complaint is with the paper not with with you. Oh and how about at least one photo? Print article This entry was posted by puttzy on December 7, 2010 at 4:17 pm, and is filed under Charlotte, One-a-day, Personal, Sports. Follow any responses to this post through RSS 2.0. You can leave a response or trackback from your own site. I’m a Sports Management Major from Wingate, and hey Charlotte Observer, anytime you guys need an intern to write about the Checkers, just let me know! 🙂 Ha! Great post! There are actually numerous details like that to take into consideration. That could be a great level to bring up. I supply the thoughts above as general inspiration however clearly there are questions like the one you bring up where a very powerful thing might be working in honest good faith. I don?t know if greatest practices have emerged around things like that, but I am certain that your job is clearly identified as a fair game. Each girls and boys really feel the influence of only a momentâ€™s pleasure, for the remainder of their lives.